Ask fellow campers about "EZ Daze RV Park" and nearby attractions. EZ check in. Large park. Nice pull thru. Spacious level sights. Mostly full time but rules are enforced and all rvs are mostly newer models. Call early if you want a site because they fill up quick. Best Wi-Fi ever. 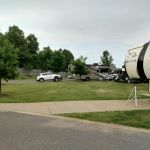 We camped at EZ Daze RV Park in a Fifth Wheel. We stayed here on our way north from the Gulf. Started with one night but because of storms in Illinois we ended up staying 3 nights. Our regular Memphis campground was flooded because it is right on the Mississippi. The view here at EZ Daze was not as nice as the other park but it was drier. 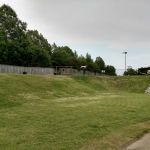 The park was well-designed and easy to navigate. It is located about 15 minutes from downtown Memphis. Lots of shopping and restaurants around. We camped at EZ Daze RV Park in a Motorhome. Overall, this is a very nice park. However, the spaces are quite close together and there are no trees. We did have a fire ring which surprised me with how close the sites were. The power was fine, the water and sewer were OK, and the hookups were conveniently located. We stayed there for an overnight on our way to the Gulf Coast, and we will stay here on our way back unless we head in a different direction. The price seemed a bit high for what you get, but we have paid more for less in other parks. The park is in the flight path for some nearby airport, so there are planes flying over fairly regularly. They are still fairly high so the noise is not objectionable unless you are sensitive to something like that. Did not notice any noise from the highway. We camped at EZ Daze RV Park in a Motorhome. Tanger Outlets is right on the other side of I-55 where you exit. There is lots of other shopping nearby. Graceland and Memphis are only a few minutes away. Rate includes 10% Good Sam discount for a two night stay. The site was back-in, concrete, level with FHU and 50 amp electric. The FHU services worked well. The site included a concrete patio area with a picnic table. The park had easy access to I-55. Memphis International Airport is nearby and plane noise at 3:30am did wake us during both nights of our stay. We had good Verizon voice and data reception and good DishTV satellite reception. We camped at EZ Daze RV Park in a Motorhome. Nice park. Site long enough for 40ft motorhome and towed vehicle. Bathroom and showers very clean and great water pressure in shower. WiFi was basically unusable. We camped at EZ Daze RV Park in a Motorhome. Very clean park, located by an RV dealership. Pleasant check in person. EZ on and off from Interstate. We camped at EZ Daze RV Park in a Travel Trailer. Very clean and neat park. Seems to be some longer term residents, but all sites were kept neat and uncluttered. Mostly newer rigs. Lack of trees in our section gave excellent satellite reception. OK room between sites but not exactly roomy. Verizon reception was great. WiFi was unusable. Even late at night I could barely get 1Mb download speed. RV dealer next door if you need parts or service. There are two sections to the park. If you're in the section across the road, some of the facilities are a bit of a walk. Dog run is unusual, it's the runoff retention pond. As long as it's not raining it works well. We had heavy showers so I couldn't take advantage of it. Easy drive into Memphis for attractions. We camped at EZ Daze RV Park in a Motorhome. Phone reservation and check in were easy. Employees were friendly and helpful. Easy access from Interstate. Park and restrooms were very clean and quiet. Level cement pads, sites are close. Very nice dog run. WiFi was weak to nonexistent. We felt like we were in a safe area. Many restaurants and shopping opportunities nearby. Garbage dumpsters were not in convenient location to many of the sites as it was at the entrance rather than the exit. We camped at EZ Daze RV Park in a Fifth Wheel. Tanger Outlet shopping nearby. Many shopping opportunities and restaurants at the next exit two miles up the interstate. Easy drive to Memphis. This is a very nice RV Park. The sites are concrete pads with grass. Long enough for our 40 ft and toad. There was a lot of rain when we were there but it wasn't a problem as they had such good drainage. Close to all the stores. They also have a huge fenced dog park that is all grass. The dogs just loved it. We would definitely stay again if we come back to this area. We camped at EZ Daze RV Park in a Motorhome. Easy to find off the interstate. Paved interior roads with level, concrete pads. Sites have picnic tables and fire rings. This is a very nice, well maintained park. It is in the flight path for the Memphis airport, although, the noise isn't bad and we didn't notice it during the night. Couldn't get a WiFi connection at our site even though we could connect at the office. We camped at EZ Daze RV Park in a Motorhome. If you like BBQ, you must go one exit north to the Memphis BBQ Company restaurant. The baby back ribs are fantastic. Asphalt roads and pads are concrete with patio. All utilizes are great and the Wi-Fi works well. Cable TV is fine. This is a very nice campground. The pool is good and the laundry is very clean. The staff is nice and helpful. The only negative is very little shade. All trees are young. You are only 15 miles from Memphis, TN and about 20 miles to Tunica, MS casinos. We camped at EZ Daze RV Park in a Travel Trailer. Stayed overnight (site 63); Checked in after office was closed, but paperwork in box; Blacktop with level concrete sites; Good WIFI and cable available; Easy On Off from Interstate; Excellent dog park. Would definitely stay here again. We camped at EZ Daze RV Park in a Motorhome. 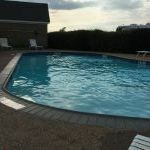 Great RV Park, friendly staff, easy on and off of I-55, near Memphis, TN. Concrete sites, spacious, mostly pull thru sites and full hooks. We camped at EZ Daze RV Park in a Motorhome. There is a large RV dealer virtually next door. All the main stores are very close. Memphis attractions are easy and convenient to get to. Graceland is nearby but this was just an overnight stopover. There are many restaurants in the area. Do NOT eat at Jim Neely's Interstate BBQ. It was not good. There has to be better in the area. On the next exit towards Memphis is a Wal-Mart, Target, and Home Depot. On the same exit as the campground is a Tanger Outlet mall. Try Interstate BBQ in Southaven and Uncle Lou's in Memphis. Lots of shopping available in nearby Southaven, MS. Sales taxes lower here than in TN just 5 miles up the road. Things to do included: Mud Island Park, Beale Street, the Peabody Hotel and ducks, Graceland and Elvis. Also a visit to Bass Pro in the Pyramid is a must! Only stayed one night. No suggestions. Very convenient to I-55 (exit 287) but not close enough to be disturbed by traffic noise. Great BBQ restaurants, Beale Street, Mud Island, Graceland, Bass Pro Shops, Slave Haven Underground Railroad Museum, Stacks, and more. Only 25 minutes from downtown Memphis. Memphis Barbecue ⭐️⭐️⭐️⭐️⭐️ 1 exit north from rv park. No reservations and expect to wait. Worth it!! !there is a bar should you want to wait and have beverage! Close to Graceland, bass pro at the pyramid, Peabody and many other Memphis attractions. Definitely a visit to Memphis for Graceland and Beale Street. Sun Record Studio was a disappointment. Graceland, The Peabody, Beale St. all within 10-15 miles away. If your planning on seeing Graceland, save some money and just buy the mansion tour. Everything else is a tourist trap and not worth the prices charged. Even the mansion tour was somewhat disappointing , as the house is not all that large and you only get to tour the ground floor, and surrounding garden. There is a big Walmart 1 exit north on the interstate. When in Memphis Beale Street is a must see. After walking the strip we ended up at B.B. Kings Blues Club, where we enjoyed a great meal and heard a fabulous blues band. The park is right behind a large RV dealer. It is located right in Southhaven near major shopping areas. A large rv dealer is right around the corner. Many good restaurants in the area but keep in mind the being so close to Memphis, traffic is heavy. Avoid morning and late afternoon and evening rush hours. Easy access to Graceland, the airport, and casinos in Tunica MS. Short trip to downtown Memphis and all it has to offer. BBQ places galore and some of the best in the country. If you go into downtown Memphis go I-55 to Riverside Drive. That gives you access to everything like Beale Street, the FedEx Forum, the Bass Pro Shop Pyramid, and Mud Island River Museum. Gigantic RV Dealership just around the corner in case you need anything. The National Civil Rights Musuem was excellent but allow plenty of time and the Cotton Musuem is worth the visit. 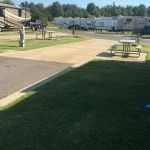 EZ Daze is right across the road from Southaven RV Center, so this is a very convenient spot if you need to have service work done. 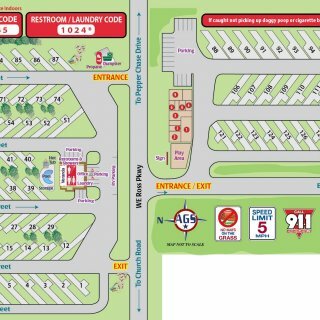 There's nothing really at this exit, but one mile north has Kroger, Target, Starbucks, Lowe's, many chain restaurants etc. Just outside Memphis and all it offers. There is a big mall nearby as well as groceries and restaurants. Are you affiliated with EZ Daze RV Park ?